Original 8N operator’s manuals. The manual on the left is the first one ever issued for the 8N. It’s dated July 7, 1947 and is the most rare. 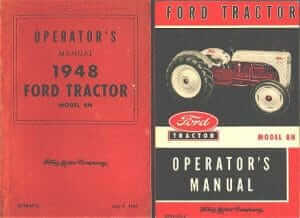 This style manual was used until March ’49 when the cover design was changed to add a 3/4 side view photo of the tractor. The position of the tractor in the photo changed slightly in 1950 to that in the photo on the right. This style manual continued until 1952. Through the years the manuals were updated as changes to the tractor were made and the date on the manual reflected the starting date of that particular printing. The ’52 manual (3279-52-C) is the most common since it was still being printed for several years after 1952.